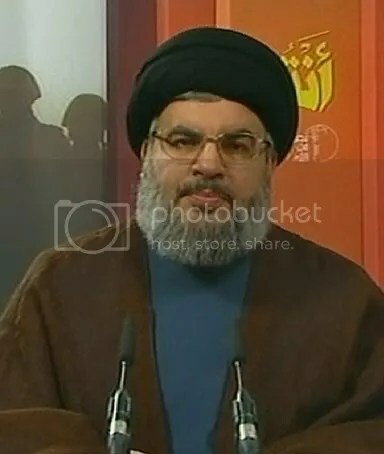 Hezbollah General Secretary Sayyed Hassan Nasrallah gave a powerful speech on the revolutions in Egypt, Tunisia, Libya, Yemen, Bahrain and other countries on March 19th, picked up by Press TV. Nasrallah had plenty of criticism for the United States, of course (what else is new), but reserved plenty for all the tyrannies in the Middle East, welcoming their downfall. He reserved much of his scorn for Gaddafi, equating Gaddafi’s attack on his own people with the brutal Israeli attack on Gaza in late 2008-early 2009. -Our gathering today is to voice our support for our Arab people and their revolutions and sacrifices, especially in Tunisia, Egypt, Bahrain, Libya and Yemen. -The value of this solidarity is moral, political, and ethical, and its effects are also moral. The origin of what is going on — which could decide the fate of an uprising here, a confrontation there, or a resistance there — the origin is the steadfastness of peoples, linked to their faith and high spirituality. -You remember that during the July  war, every word and statement in any state and anywhere in the world had its impact on the resistance, the people and the displaced. -The same is the case with the Arab revolts. We tell them that we support them, that we stand by your side and we are ready to help you toward your interest and ours, with your and our capabilities. -We have to stress that these revolutions are the will of the people themselves. Any accusation that the US manufactured and launched these revolutions is unjust speech toward these peoples, especially that we are talking about regimes which are allied with the USA, serve the American project and pose no threat to Israel. This is a positive development. I had expected that Hezbollah might side with Daffy.